Bedraggled and weary, with the cold breath of winter on their heels, they came to the Night Court. Only when they reached the ruins of the Dragon Gate did Asterion’s face register anything beyond grim resignation. There he paused, wondering, but the skies were darkening and threatening snow and there was no time to spend among lengthening shadows and crumbled stone. But perhaps his steps were lighter after that, as they descended from the pass into Denocte. It was a different city than the last that had greeted him. Then he had been a fleeting shadow in the darkness and driving rain, with no thought but for Aislinn; he had noticed none of the markets, none of the performers, none of the things that made the capital the City of Starlight they claimed it as. Now, with the first stars emerging through the thinning clouds and the sharp, familiar tang of the sea, he took a long look at their temporary home. Denocte had not escaped the last months unscathed; there were still markers of the tsunami that had swept in, the storms that had raged. But there were lanterns lit all down the cobblestone path to the keep, and bonfires threw sparks and the smell of sweet woodsmoke to the sky like an offering. Asterion closed his eyes and inhaled, quieting his grieving heart. And then with his people he went down into the city. @Isra and any of Night Court/Dusk Court who wanna be a part of the temporary re-homing! This is set somewhere after the disasters where the Dusk Court is still flooded and muddy and in the midst of winter, so the injured of Dusk/anyone who wishes to is seeking temporary shelter in Denocte. They came before she was able to escape from the heavy walls into the crystalline winter mountains. For a moment guilt makes her steps stutter as she spots the first of them, lit by lanterns and bonfires. The emotion razes her like another disaster and she prays to any gods left to pity them that all who came survived the mountain path. 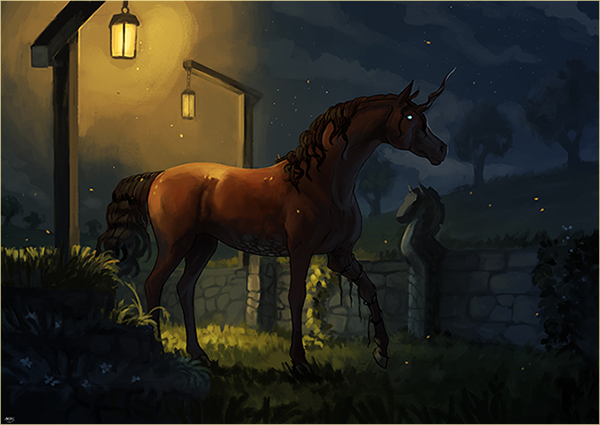 Guilt still lingers in her eyes as she quickens into a trot to greet them and it still feels strange to feel her bones move so elegantly in the night (as if she's more deer than horse, more unicorn still). On her the fires cast back strange patterns. Her scales ripple like a wave and her chain rings and keeps pace with the steady thrum, thrum, thrum of her starlit soul. She's both a creature of sea and space and it's almost easy to see the awkward way she still shivers in her skin, as if it's both too loose and too tight at all once. “You came.” She says to the stallion in the front, knowing him only for the damp smell of him that smells almost like musk beneath the winter frost. Her gaze flicks from the dusting of dull star-shine on him to the fires and she thinks that each might contain a world of things that even her imagination might stumble over. Her hooves too stumble over the ragged pathway as she moves close enough to offer what little heat her flesh has left to give. Behind her a few merchants from Denocte gather, breaking out from between the bonfires with blankets. They smile from beneath the scars and suffering and they forget for a moment that they too suffer and freeze. 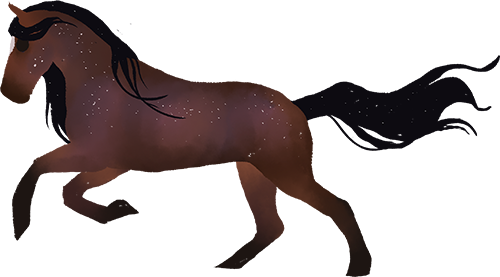 “I'm Isra.” She offers as a beam of moonlight glints off her brow that wears no crown and she's nothing more than a unicorn beneath the stars and between the bonfires. “We have room in the infirmary for the sick and hearths are ablaze for the cold.” Almost cautiously she offers a touch to the stallion leading them, wondering perhaps if he might be their King, if they might be the two leaders of broken courts. As she waits for the rest of her court to join them, and offer what little they have to share, Isra says simply, “Welcome home.” Around her the darkness seems to hum, louder almost than the crackling fires and the worlds that roll in stories between the blinks of her blue eyes. He is no longer a dreaming boy with starshine in his eyes but a man, weary, uncertain of how best to bear the burden thrust upon him. Asterion hardly recognizes himself, not even the private rooms of his thoughts, and so perhaps it is not strange that he is half-numb to the wonder of the Night Court and its new queen. Little of her marks her status as she makes her approach, but for the bay stallion the horn on her brow is sign enough. What surprises him, catching his eye, is a shimmer like moonlight on the sea, and he looks to her scales, to her rusted and winding chain. Asterion has never known a unicorn to be weak, and already he feels that Isra will be no different. It is not difficult, then, to picture her penning the words she’d replied to him with: she walked with the same kind of grace she wrote with. When he dips his slender head to her, it is not as a king but as a man that he gives his respect. “Even if we’d been able, we could never refuse a letter like that.” He had not wept, as he’d read it – but even in his bone-weariness relief and gratitude had carried him like a tide, there in the quiet of a castle turning cold with winter. Asterion finds that some of the feeling is still with him, pulling his lips into a lean smile that has been all but absent since the summit. When she steps nearer and he smells something of the salt and promise of the sea, he thinks of home before anything else. This surprises him enough that he does not move away, shy as a deer, from her touch, but lets his shoulder almost-brush against hers, lighter than a shadow as her people wind forward with blankets as warm and welcoming as their smiles. Oh, how strange it feels to let his misgivings wash away like mud carried to sea by clean water. Her name draws him back, verifying what he already guessed, and he thinks that he could never come up with enough pretty, earnest words to show his heartfelt thanks. It was never his strength. “I am Asterion, and already in your debt.” His gaze touches her, soft and dark, and then turns away when the velvet of her muzzle finds him; his weariness, his sorrow, is replaced by a new wash of nerves, swift as a stream in spring. Around them their citizens mingle, tentative greetings between strangers and warm ones between old friends, and Asterion blinks away a limn of silver from his eyes. It stings in the cold, and he prays it is lost in the deeper shadows between the firelight. Welcome home, she says, and again the scent of brine and sea washes over him, and he meets her eyes that shift in the semidark like the waves beneath a storm. And yet he does not take another step – he waits to follow her, wondering what else might be nothing like he’d imagined. “And I could have written nothing else.” Her eyes look at him with darkness, oil slick spots over the green and each spot glistens with sorrow and stories and understanding. There are dark things in that gaze of hers and darker memories when the fires spark and hiss and she watches the darkness slip over him with something like kindness and like cruelty. In that moment Isra isn't sure if it's dreams or sorrows or the knowing of dark things that rises up her soul and touches the air around him like a cat stretching in a first rays of daylight. Some part of her feels awake and another part shivers for the knowing of it. Strange is the mix of salt and stardust, sorrow and constellation. Strange. She thinks as her thoughts run wild when their shoulders brush like silk sheets before letting the night slip between them again. “Let there be no debts between us.” Words finally come to her and she catches them like fireflies between the drifting moon-dust of her thoughts. And perhaps a little of the whimsy of catching thoughts like wishes slips out in her voice and makes it toll like almost-laughter, almost-shyness, almost-song. Really though she caught the words because she doesn't want to owe this man of star-light and blackness a thing. Isra thinks there is not a bone in her body strong enough to hold all the weight of him, all that sorrow and retrospection and dreaming wonder. They are dreamers she thinks, sorrowful and hopeful and when she watches the night go on around them like waves around stones she knows they should go around and around and around like storm-clouds. They should never touch the ground. “Will you let me show you the night?” The fire and moonlight catches on the ocean of her eyes and all the oil-slick darkness dissipates to glitz and dreams. Stories dance in her eyes, spots of fire-light that look like shapes dancing across the blue, twisting and turning. The light dances and ebbs as the bonfires dance between the wind. Everything smells like silk and smoke and salt. And Isra dares him with her gaze to blink back his sorrow and eat of the air and forget for a little while that both them are more made of black, black, black than starlight. Let there be no debts between us, she says, and Asterion wants to tell her that oh, he used to live that way - nothing owed, only given - but that he has forgotten how. Long now is the list of debts he has, complicated as sailor’s knots, a hundred strands of hemp that moor him to Terrastella. Is love the same as debt? He wonders it there in the darkness, and shivers again, and thinks of how weak his body has become, now he sleeps between stone walls. “I’ll do my best,” he says, smiling like it’s a joke, knowing it’s all he’s ever been able to say. There is something about her that makes him feel like he’s in that place between dreaming and waking, when you could see the moonlight pooling in front of you but when you dreams are still half-real, as thick around you as fog. A place where anything could happen, where you could go back into the arms of sleep or rise to face the day. It is nothing at all like he’d felt meeting Reichenbach. There was no dreaming to the gypsy-king, only life, richer than anything Asterion could imagine. Isra’s way is easier, to him, but no less strange. Her question then is not wholly a question and the bay tilts his chin, almost amused and almost jealous of the way she has already mastered this. To him his questions seemed only that, and he has yet to give an order at all. The wind catches all the fires at once, making them bend and spark higher, changing the light on her face, in her eyes, glinting off her horn. All of a sudden it isn’t a sad situation, one of sorrow and defeat - it’s an opportunity, an invitation to a ball. An open door into a story he didn’t think he would ever learn to read. Asterion is nodding before he can catch himself, and then remembers that he is no starstuff-wanderer but a king with a broken people at his back. “Let me see to them." He turns away before he can watch any emotion move across her face - no debts, he thinks. He speaks a few soft words to one of his chief counsellors, then looks once more at those gathered around them. If he hadn’t known them, from the journey and the long weeks before and the year before that, he wouldn’t have been able to tell who was of the court of twilight and who was of the court of stars, and he thinks that is not such a bad thing. And then he turns back to Isra. Wonders, as he does, how many times his heart will lead him here, to starlight and to midnight, iodine and cedarsmoke. At least one more, he thinks, and wears a smile in the shadows as he nods at her, the dark tangle of his mane falling away from the lone star, small and pale, on his forehead. “Show me your city as you see it,” he says, and his heart rests on a current caught between excitement and guilt. Their people tangle together-- dusk to night, stardust to pastel hued moonbeams-- and Isra when she brushes the trail of her tail at his hooves entwines the two of them as well. And then they are just black and bay, twilight and ocean-blue. Their shadows too bend and mold against each other until there is only a massive hole of blackness at their hooves, blackness, cobblestones with flickering firelight edges and nothing else. Together they walk, Isra almost brushing her belly against his and there is still only shadows and starlight between them. The bonfires are almost behind them when she starts, “When I first came here this path seemed different. It has always been beautiful with the bits of marble between the stones that glitter with mica. But when I walked it first it seemed to me like a slumbering dragon, scales of glitter and night and slumber that hid violence with loveliness. Each step I took fear followed me and my shadows were not mine but the shadow of a reaper's scythe that dogged all my hoof prints like a predator. For months I lived in cobwebs and fear, hunger and want.” Each of Isra's steps seem now not like a step upon stone but a ringing bell, a soft melody broken up by a story-teller's song. Words flow like spring creeks from her lips, her teeth the rocks that break up the down-hill current of all the things that live inside her. Ahead the castle waits, doors of cedar wood and iron rimmed in crystals (one of every color for the dreams of her court) rest open on their hinges. It's an ode to the dragons of the past, massive and mighty and perhaps were they not open terrifying. And when Isra pauses in the doorway and looks back at him the seem like an archway into another universe, a place where anything is possible, any dream and any nightmare. There is no fear in her now. Now she is only a unicorn and her chain is only a strange metal between which harp-strings might be strung. She is a queen who wears a horn instead of a crown and moonbeams and stardust instead of silks. “Fear is a thing I could almost forget and my shadows are promises instead of graves. My worries are made of comet-dust instead of ash and embers.” Isra swallows up the between story, eats the frost-fire with forgiveness and the salt-waves with that new fire in her bones. Perhaps Asterion will piece together the then and now, perhaps he will remember a girl of glitter and scales who told a story by a tree in a meadow of flowers while he walked around and looked only up, up, up. Either way Isra doesn't give him a chance to ask and she turns and walks under that doorway of crystal, iron and wood. Ahead a room of quartz and blue-stained marble walls waits for them. Chandeliers hang from gold-leaf edged ceiling and their small fires cast strange kaleidoscope shadows over them as they reflect off the crystal and glass. It's easy to forget the stains of water that linger at the bottom of everything, the brine that breaks up the cedar-smoke and spice smell of the castle. Easier still to glaze over the way the scales of her belly dissolve into the dark shadows of the night that pool in through the arched windows. And when she smiles it's easy to forget that they are from two different thrones and two parts of the same world. “Are you cold?” Isra asks and it sounds like a challenge of that dreaming sea and they could either float away or sink below the surface and see what the dark holds. Sometimes it is easy for him to forget that they are social animals - that in his beating heart, the thing of blood and sinew and not of seawater and dreamstuff, he craves touch, craves togetherness, hungers to belong more than he does for food or for drink. He does not think of it now, either, but his heart knows, and it sighs as their tails entertwine, as their shadows mingle, as they walk together into the night. For a long time there is only silence, and as it is with Eik, Asterion feels no rush to fill it. It is not an empty kind of thing, after all, but a breathing one - filled with shadows and starlight and flickering flame, with the tide of their breathing and the tide of the sea. Still, when she breaks it he leans in, bending toward the start of her story like a bloom to the sun, and he sighs, content, too quietly to hear. As she speaks he looks down, and such is her magic and his dreaming that the path does her bidding: it changes beneath them to the river-course of a galaxy of stars, to a hundred unnameable constellations, and then to a dragon with flashing eyes and mica teeth. Over them drifts the smoke of a dozen bonfires, only strengthening the illusion, and the bay king dares not interrupt the net her story weaves. In no time at all they are at the doors of the castle and Asterion stands before them and marvels. They are nothing like Terrastella’s, cypress wood from ancient swamp-trees gleaming dark and dutiful. He has never been inside them, but when his gaze drifts down to find hers watchful on him he pushes away the weight of the past the way he might push back a wave with his magic. Asterion listens to her words, lets them settle in his heart, and thinks oh how her people will love her. There is no envy in it, only awe. It sounds like the beginning of a story, but he never offers more. What are his words after hers? A boy playing a tin whistle after listening to a musician whose songs could make the clouds weep rain. His curiosity rises in him as the great hall swallows them up and it feels like a friend from childhood he can hardly recognize. The king wants to drink everything in like he has never wanted wine or mead, wants to study each room full of pooling moonlight like he could never study a book. And when she speaks his gaze goes to her, soft and full with wondering, forgetting for a moment its sorrow, and he studies her, too. His silence is a heavy thing between them when he finely breaks up the winding weave of her story. It hangs on her thoughts like ore and drags down her skin like a dull sword that belongs to a dead knight. This sort of silence is a familiar thing, a hollow beast that eats and consumes the world until it explodes like a supernova into something as impossibly lovely as it might be complicated. There are a million stories of fear and bravery and knights that she could tell him. Isra could fill centuries with stories of fear but somehow with the smell of brine hanging like a ghost around her only one feels right. “I forgot once how to feel, before I was a unicorn.” Her voice ends like a eulogy, suddenly devoured up by the heavy silence that feels like a ore and a sword. When she looks up towards that golden ceiling the rest of the story eludes her, skipping away from her like a grasshopper before that carrion snake of silence. Isra is happy to see it go and happier to feel a bright burst of joy when no more words come. “I can show you a secret.” All of her seems more unicorn than queen and each of her words drips with life as if she's been consumed with the poison of living. When she turns all the light seems almost to shift and flow to her before she enters a long and winding hallway. Like a siren she leads him on with nothing more than the melodic song of her hooves and her chain and the soft coo of her tail across the stones and the carpets. On and on the hallway and her song seem to go, circling around each other. One moment they are walking on the boughs of her song and the next only on dark-seas and musty forgotten fabric. On it goes until suddenly they are not walking anymore and the hallway has opened up like a cave-mouth before them. The air here smells not like brine but steam scented with cedar and balsam and dead, paradise flowers. Stone gives way to water that could be still but for the shifting firelight of low-hung baskets full of wood and coal that sway in some source-less breeze. Of course this is the secret. The whole world feels dusted in heaviness here. Even Isra doesn't know who lights the fires overhead or who burns oils and branches to make this whole room feel like a dream. “Are you still cold?” She laughs, amazed at the way the mist moves before her as if her words are dragon wings cutting through clouds. And with a look that is another challenge she walks into the water, smiling as secretly as the fires blaze when both the mist and the water swallow up her body. “Perhaps I should have,” he agrees softly, and it is a strange kind of smile he wears then that carries little true happiness but is also not a lie. That is one of the many things he has learned, in his time in Novus - and he is learning still. But that is not all she has to say on it, and he listens to the queen, as new-made a sovereign as he is himself. He wonders about that, too - he had heard that Caligo herself had chosen Isra, when Asterion had only been appointed because Florentine had been broken both in body and mind. Who, then, is the truer ruler? He knows the answer, and doubts not at all when she speaks of fear. “I’ve never heard someone say anything like that,” he tells her, and for the first time in days there might be the reflection of starlight in his eyes. He is no stranger to his sister’s whimsy (they share a little of the same dream-stuff blood, after all) but even Flora does not speak like this unicorn, like the words have already been written in a book well-loved. Maybe this, then, is the moment he is caught, and lets himself soften into Night. And even still she is not finished. But she looks up, and the twisting, shimmering lights shine down on her shyly, in little panes of gold and glass. Ira offers him a secret, and though he wants to tell her that there are many secrets, now, he might beg to know of her, he holds his tongue and nods, and follows. Asterion does not dare break the silence that cloaks them then, a veil of starlight and smoke. He does not even think of those outside, the ones he has brought (to doom them or to save them he still does not know). The bay is torn between drinking in each column, each tapestry, each room they pass through and between keeping his gaze only on the unicorn. It is the unicorn he is watching, and the way the light glistens on her horn, and how different she is from Calliope (and how the same, too) so that he does not even notice that the scent in the air has shifted from smoke to roses until they are standing before the pool. “Oh,” he breathes, and stops short beside her. Now there is nothing at all in his face but wonder; he has never seen anything like this, never thought such a thing could exist. The reflection of the torches are hazy on the steam and the water, like the moon over the sea; the walls might be a cave but for the way the place smells, nothing of cold and dank minerals. The sound of her laughter more than the words themselves have him looking toward her and for the first time in months he feels like Asterion. Only like himself and nothing more - not a boy playing at king, not a man who tried and failed to have his love be enough, not a wanderer who could never name what he most wanted. He does not trust himself to speak; he only smiles in a way that is almost a grin, and shakes his head, and follows the Queen of Night into the water.